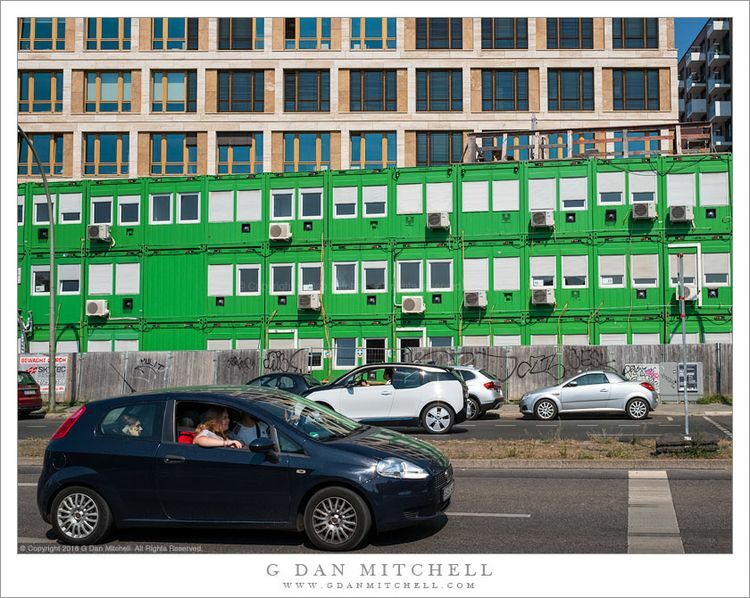 Green Building, Berlin. © Copyright 2018 G Dan Mitchell – all rights reserved. A street scene in Berlin with a green building. This green structure — whose purpose I did not investigate — is striking against this background and in this location literally across the street from The Wall. It appears to have been conglomerated from shipping containers, creating an ad hoc and temporary quality. (It isn’t the only example of such things I saw in Europe and the UK.) It sits at an odd angle, out of sync with both the surrounding grid of roadways and the backdrop of more “square” buildings. And that color!